The duplicate rows are shown here shaded in green. Either select the whole list of data, or just select a single cell within the list. Complete the dialog box as shown in the diagram below. 4. 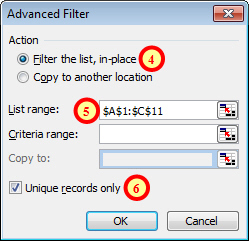 Choose whether to delete the duplicates from the original list (Filter the list in place) or copy the unique records to a new position (Copy to another location). When you click OK you should find that you are left with one copy of any duplicate rows in the list. The list now shows only one entry for the duplicated data. What Happens to the Duplicates? In Excel 2003 the duplicated data isn't truly removed from the list, rather it is filtered out by hiding the rows containing duplicate values. If you look at the row numbers on the left hand side of the diagram above you'll notice that number 7 and number 11 are missing. You should find that you see all of the records again. If you want to truly delete the duplicate values in Excel 2003, the easiest way to do it is to choose the option Copy to another location within the Advanced Filter dialog box. This will copy the unique values to a different set of cells. You can then delete the original list completely and then optionally copy the unique values back into the cells that were previously occupied by the original list. Deleting duplicates from the list is rather awkward in Excel 2003. Read the next part of this blog to see how easy the process is in Excel 2007 and 2010, or visit our Excel training page.